Data for peer lending marketplaces such as Lending Club and Prosper are very transparent, which is a boon for statistical analysis. In addition, Peer Lending data is more accurate since we can see borrowers’ actual behaviors, rather than relying on self-reported surveys. While the percentage of wedding loans is small (less than 1%), this 1% still represents thousands of loans; more than enough for a meaningful statistical view. People may propose on Valentine’s day, but statistics also show it’s when love becomes official: February is the month when the percentage of loans taken out for wedding expenses is the highest. Oddly enough, there does not seem to be more engagement rings purchased in February compared to the rest of the year, although both March and November experience a bump in borrowers. How well does the two-month rule line up with reality? De Beers created the “Two Month” salary rule in the 1930’s that states that a man should spend ‘two months of wages’ on a ring. If more borrowers followed this rule, engagement rings would be noticeably larger. According to borrower data, most spend approximately 1.3 months of income on their engagement ring. The average wedding loan is slightly higher at 1.7 months of income. People who borrow for weddings and engagement rings are almost twice as likely to pay their loan off early. Borrowers for engagement rings are much less likely to default compared to the average loan. But sadly, the probability that a wedding loan will default is almost double that of the average loan! The Hazard Chart is representative of when a loan will default (if it is going to default) during its lifetime. The data shows that wedding loans are likely to default sooner than the average loan, but are less likely to default in months 7-25. 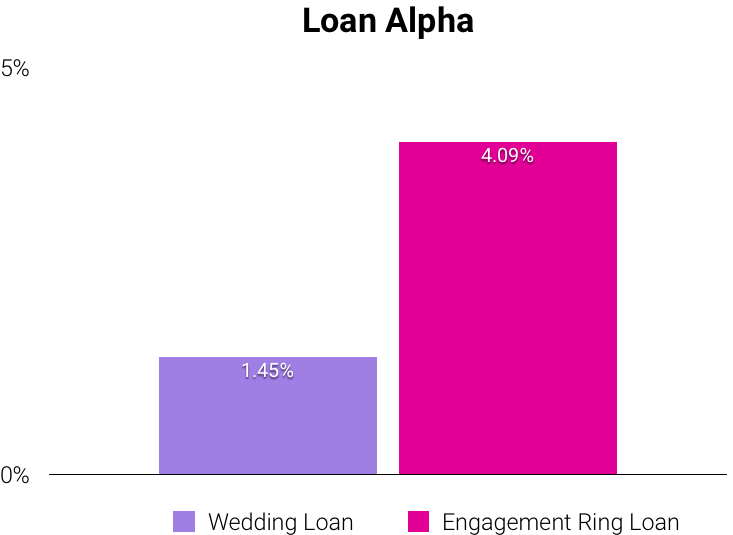 Despite the increased likelihood of default, both wedding and engagement ring loans seem to be good investments for lenders. On average, wedding loans return 1.45% more than the average Peer Lending loan, while engagement rings return 4.09% more than average. Join LendingRobot today, and start earning investing in loans with great potential!